Anyway, I’m thinking if you can make sweet yet sugar-free muffins that are healthy enough that they would work for either snack or healthy breakfast, that’s a winner in my book – how ’bout you?? TAMMY’S NOTE: This No-Sugar challenge documents Ashley’s 30-day attempt to remove PROCESSED SUGAR from their diet. This challenge allows her to use natural sugars such as fruit, honey or true maple syrup. Therefore it’s not meant for a diabetic alternative, simply a personal-health challenge for her. From Ashley: I don’t want to take credit for being creative enough to have created these from scratch. I have researched ways others have made sugar-free desserts and modified different ingredients to my own tastes. I just cannot pinpoint the exact starting points for these recipes. Preheat oven to 375 degrees. Mix all ingredients in a large bowl until even distributed. Spoon into muffin cups (makes approx. 24) and bake for 20-25 minutes or until firm. Cool on rack for 10 minutes. Can be enjoyed fresh or stored in refrigerator for up to 5 days. 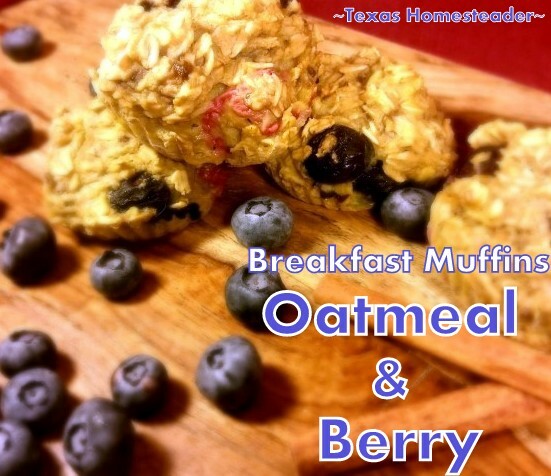 Feel free to enjoy these as breakfast, snack, or dessert. Cooking Breakfast Should Include HAZARDOUS DUTY PAY! 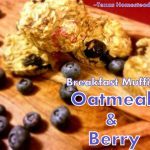 This entry was posted in Blog Posts and tagged Cooking, Frugality, Make-It-Yourself, Recipes on October 25, 2015 by Texas Homesteader. i love that this is very easy , simple and healthy! I would love for you to share this recipe over at Healthy Living Link Party , it went live last night (7pm Central time) but it will be open until Nov 1. Hope to see you there! Thanks for the invite Cristina, think I’ll ‘hop’ on over!